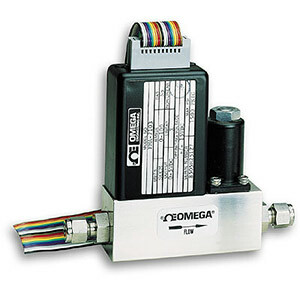 OMEGA™ FMA-7000E Mass Flow Controllers accurately measure gases on the basis of mass flow. The flow sensor produces an electrical output signal linear with the flowrate used for indicating, recording, and/or control purposes. It eliminates the need for continuous monitoring and readjustment of gas pressures to provide a stable gas flow. This is accomplished automatically by an electromagnetically actuated flowrate control valve. OPERATING PRINCIPLE The operating principle of the controller is thermodynamic. A precision power supply directs heat to the midpoint of the sensor tube carrying the flow. On the same tube, equidistant upstream and downstream of the heat input, are resistance temperature measuring elements. With no flow, the heat reaching each temperature element is equal. With increasing flow, the flow stream carries heat away from the upstream element, and carries it towards the downstream element. An increasing temperature difference develops between the two elements and this difference is proportional to the mass flowrate of the gas. A bridge circuit interprets the temperature difference and an amplifier provides the output to the control circuitry as well as a 0-5 Vdc output signal. 참고: Comes complete with mating connector and operator's manual. Calibrations done at ambient temperature only 20C(70F). *Please specifiy gas, inlet, and outlet pressure when ordering. Additional charge for calibrations between 201 and 999 psig and 1000 and 1500 psig. For NIST certificate add suffix "-NIST" to model number, add $425 to price. NIST certificate does not include points. All models are custom, consult specification page for a complete product description and list of available models.